Before you entrust your manuscript to someone, consider these tips for hiring the right freelance editor for you and your manuscript. TIP #1: Know the editor’s specialities. Not every editor can help you with any type of book. Editors may work in several genres, but most specialize. For example, I would not be the right editor for you if you’re writing a screenplay or a textbook, but I love editing memoirs and novels. Also, some editors will happily review book proposals and query letters, while others won’t tackle these kinds of materials. An editor may be able to recommend a colleague to fit your needs. You can find freelance editors working in all genres through the Editorial Freelancers Association (I’m a member! ), ACES or Editors Canada. TIP #2: Request a test edit. Many freelance editors will ask to see the first five to ten pages of your manuscript before providing a quote and estimated turnaround time. 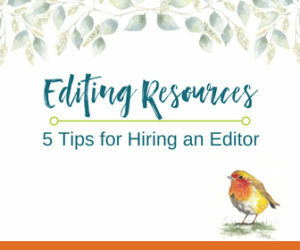 Reviewing a few pages lets the editor know if he or she is the right person to work on your manuscript and determine how extensive an edit is required. This also gives you an idea of what you can expect in terms of feedback and manuscript work. TIP #3: Make sure the rates and terms are agreed upon before the work begins. Once an experienced editor takes a look at your sample pages, she should be able to give you an estimate of her fee and turnaround time. This is just an estimate of course, but a good editor will advise as soon as possible if she determines that it will take longer than expected. Most editors request that payments be made in two installments: the first 25-50 percent when you submit your work and the balance upon completion. If you need your pages returned in a hurry, an editor may be able to accommodate a quick turnaround for a rush fee. TIP #4: Make sure you and your editor are on the same page (figuratively speaking). This tip is two-fold. First, understand what you need from an editor. Take some time to think about what kind of assistance would most benefit your manuscript. Is your grammar lackluster? Does the plot seem to falter around page 200? Are the character’s motivations feeling flat? Knowing where an editor should focus her energy can be especially helpful in addressing specific concerns. If you need a book proposal or synopsis review, it’s a good idea to find an editor who has written one herself or who has experience in pitching them (such as a literary agent-turned-editor). TIP #5: Be prepared for honesty. Even though you’re teammates, your editor’s job is to be truthful when it comes to your work. If it’s not ready for publication or an agent, she should tell you so. You’re paying for an honest evaluation of the work that needs to be done to make your manuscript the best it can be. That said, comments should never be mean-spirited. Also, keep in mind that it’s not your editor’s job to rewrite your pages. For example, if your editor suggests that the character of Sally is flat, she may provide suggestions on how to make Sally a more well-rounded character, but she won’t reinvent Sally for you. As the author, that’s your domain. Have more questions? Check out my FAQ page.